Hall effect thrusters have been classed as both electrostatic and electromagnetic propulsion systems. An electrostatic field accelerates the ions in the propellant stream but that field is, to a large extent, produced by the actions of plasma electrons interacting with a magnetic field, giving both classes a claim to the technique. In Hall effect thrusters, also referred to as closed drift thrusters, a heavy gas, xenon in most implementations to date, is ionised and accelerated by an electric field. An electron current passing through and being impeded by a magnetic field establishes the acceleration field. The precessing electrons in this magnetic field follow a closed drift path, giving rise to one of the names for this technique. The flow of the drifting electrons, which is perpendicular to both the applied magnetic field and the current flow in the plasma, is due to the Hall effect, the source of the other name for this type of thruster. The mechanical configuration of a Hall effect thruster is an annular discharge chamber in which a radial magnetic field is established between an inner, cylindrical ferromagnetic pole piece and an outer, ferromagnetic ring. The chamber is closed at one end, where an annular anode is situated. The other end of the chamber is open and forms the exit path for the accelerated ions. 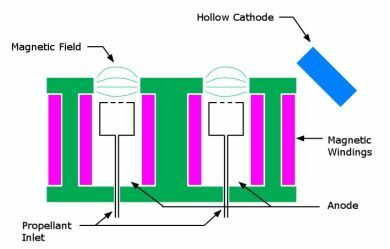 Outside the chamber, beyond the exit for the ion stream, is an external cathode. As the electrons emitted by the cathode move towards the anode under the influence of the applied electric field, the radial magnetic field results in a force acting on them in a direction perpendicular to the plane containing the two fields, which causes them to drift in an azimuthal direction. This azimuthal drift results in a Hall current and impedes the progress of the electrons towards the anode. The Hall current is the result of the electrons gyrating around the magnetic field lines in a plane parallel to the applied electric field. The gyroradius is larger when the electron is being accelerated by the electric field (moving towards the anode) than when it is being decelerated by it (moving towards the cathode), giving rise to a net azimuthal drift, the classical Hall effect. An appropriate choice of magnetic field strength (typically a few tens of mT) and axial field profile results in the electrons being effectively trapped in a closed-drift azimuthal orbit near the area of maximum field strength, where collisions between electrons and with ions, neutral particles and the chamber walls permit a slow diffusion of electrons towards the anode. Due to the lack of axial electron mobility, the plasma can sustain a very high electric field along the axis of the discharge chamber. The trapped electrons form a 'virtual cathode' held at very nearly the same potential as the external real cathode. Propellant atoms are introduced through holes in the annular anode. These atoms are ionised by collisions with the azimuthally drifting electrons soon after entering the discharge. The propellant ions are then accelerated by the axial electric field, generating thrust that is transmitted to the structure of the thruster by the interaction between the Hall current and the magnets creating the radial field. As the accelerated propellant ions exit the discharge chamber, additional electrons from the external cathode are used to neutralise them. The neutralisation of the exiting ion stream is necessary to prevent the spacecraft from acquiring a charge, which might result in equipment malfunction or even damage, if the charge were allowed to build to the point where discharges occurred. The proper operation of a Hall thruster is dependant on the strength and axial profile of the magnetic and the relation of these parameters to the geometry of the discharge chamber. The magnetic field strength must be such that the electrons are trapped in the chamber, unable to move directly to the anode and cause a short circuit, while propellant ions are able to escape. This is achieved by arranging for the length of the discharge region to be greater than the gyroradius of the electrons but much less than the gyroradius of the ions. In order to achieve stable ion flow, the strength of the radial magnetic field should increase with increasing axial distance from the anode. The magnetic field maximum defines the end of the ion acceleration zone and needs to be located within the acceleration chamber. Hall / closed drift thrusters are divided into two types, stationary plasma thruster (SPT) and thruster with anode layer (TAL), based both on geometrical and material differences in the discharge channels of the two types, and on the different physical processes that take place within the discharge plasma. In the stationary plasma thruster, the acceleration channel length is comparable to or greater than the diameter of the discharge chamber and the walls of the chamber are composed of a dielectric, ceramic material (usually boron nitride) that serves to protect the magnet poles from plasma erosion. The thruster with anode layer has a very short acceleration channel and the discharge plasma is positioned downstream of the thruster exit plane, obviating the need for protecting the magnet poles. Although the two types of thruster are similar in layout and operating principle, the different materials and mechanical configurations used for the acceleration channels greatly change the underlying physics of operation of the thruster variants. The dielectric material used for the walls of the SPT has an emission coefficient for secondary electrons emitted following impact by gyrating electrons of approximately one. The high electron re-supply rate due to secondary emission limits the potential drop across the plasma sheath adjacent to the chamber wall and a large number of discharge electrons are able to reach the chamber wall. The effect of the presence of the dielectric material is to limit the kinetic energy of the confined electrons. As trapped electrons diffuse toward the anode their kinetic energy is increased by the applied electric field. When one of these higher-energy electrons impacts the dielectric wall it is absorbed and a much less energetic secondary electron is emitted. The result of the collision/secondary emission process is that the dielectric wall serves to substitute hot electrons with colder electrons. By limiting the discharge electron energy, a smooth and continuous variation in plasma potential between the anode and the cathode results. This is the type of thruster selected for SMART-1. In contrast, the thruster with anode layer has discharge chamber walls made of a conducting metal with a much lower secondary electron yield. Additionally, these walls are maintained at cathode potential, thereby greatly reducing the incidence of gyrating electron impact with the walls. As the electrons diffuse towards the anode their kinetic energy increases significantly. 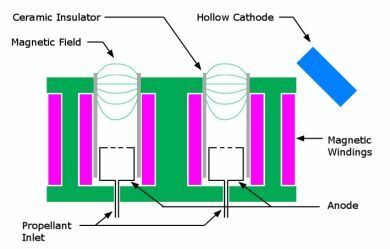 Near the anode the electrons become sufficiently energetic that the upstream thermal diffusion towards the cathode becomes equal to the applied electric field diffusion towards the anode. At this point a very abrupt, discontinuous potential jump occurs in the plasma over a very thin layer near the anode, hence the term thruster with anode layer.